just looks like our yellow brother eh. Just get a hammerhead shark and you’ll have the makings of a proper set. Yes, this is in fact a sawfish, not a sawshark. 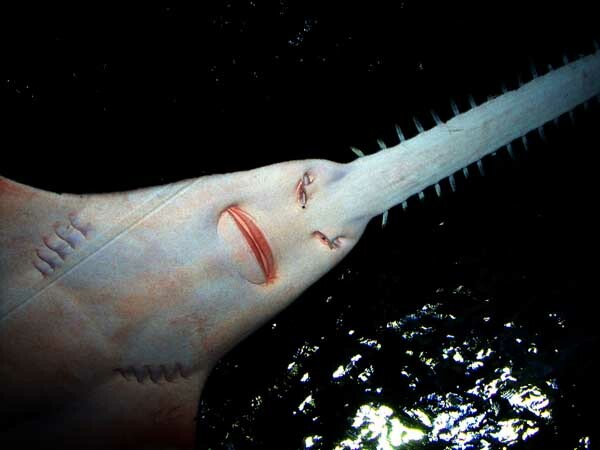 Sawfish are actually rays, if you can believe it! They are in the same family as sharks, as they both lack a skeleton of bones. And the long snout, or rostum, is NOT used to blade victims, but instead to dig through the sand for hidden prey, such as mollusks and crustaceans. The rostum is covered in millions of tiny ultra-sensitive pores, much like the barbels on the mouth of a bottom feeding shark, that allow it to detect prey hidden under the sand, and then with it’s long rostum it’s able to dig them out! And the ‘teeth’ on the rostum are not teeth at all, but denticles, which is the skin-lke materiel that covers a sharks body.